Vault Beach is a wide shingle beach with some sand at low tide on the South Cornwall coast south of Gorran Haven. There are no facilities and parking is some distance from the beach. 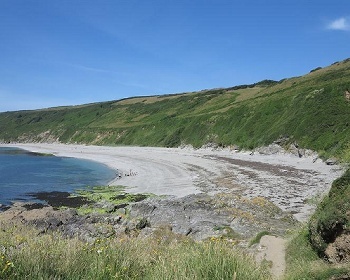 The coast path can be walked to Dodman Point. The paths from the car parks are steep in places. The path from Lamledra takes about 15 minutes walking, the path from Gorran Haven takes about 30 minutes. Dogs allowed all year at Vault Beach. Vault Beach is 9 miles from St Austell. Approaching St Austell on the A390 turn onto the Mevagissey Road the B3273. Shortly after Pentewan turn right for Gorran Haven and follow this road all the way to Gorran Haven. Park at Gorran Haven and walk the coast path south to Vault Beach. Alternatively shortly before the Gorran Haven car park turn right and drive the short distance to the Lamledra car park and then walk the footpath to Vault Beach. Car parking in Gorran Haven and Lamledra. No toilets at Vault Beach. Nearest toilets are at Gorran Haven.